The concept of Sustainable Aviation Fuels (SAF), which help fight climate change by reducing carbon emissions from the aviation sector and boost food production, are no longer theoritical aspirations. Etihad Airways successfully operated the first commercial flight on January 15 this year, partially fuelled by locally produced biofuel derived from plants grown in saltwater. Although around 160,000 passenger flights arund the world have flown on a blend of sustainable and traditional jet fuel since the first biofuels were certified for commercial use in 2011, the Etihad’s flight distinguished itself in the fact that it was the first in the world to be powered by biofuel produced in the desert, using salt water. Abu Dhabi’s ambitious Seawater Energy and Agriculture System (SEAS) project to produce alterative aviation biofuel along with seafood will bring overall benefit to economy, environment and food security. A boost to the aviation sector will positively impact the UAE’s economy as aviation is one of the biggest drivers of the UAE economy and the added value to this sector will bring tangible growth. WHAT IS THE SEAS PROJECT? The Seawater Energy and Agriculture System (SEAS) is aimed at bolstering the economy by supporting the growth of multiple sectors in the UAE, such as aviation, oil refining, agriculture and aquaculture. The initiative of the Sustainable Bioenergy Research Consortium (SBRC), it creates a new agriculture industry using salt water and desert land to grow salt-resistant cash crops producing biofuel in the UAE. It also supports the UAE’s growing aquaculture sector [producing seafood] that has an investment of more than Dh100 million. SEAS creates a new agriculture industry using salt water and desert land to grow saltresistant cash crops producing biofuel in the UAE. It also supports the UAE’s growing aquaculture sector. The project also bolsters the oil and gas industry by using existing refining infrastructure to generate biofuel [Synthetic Paraffinic Kerosene -SPK] from the oil extracted from the seeds of a plant called Salicornia. The SPK does not immediately replace aviation fuel. Rather, it adds value to the oil and gas infrastructure and produce Sustainable Aviation Fuels (SAF) for the future. The SEAS involves two things: producing fish and shrimp through aquaculture and growing plants that contribute towards the seeds that in turn help in generate the bio-fuel. The waste from fish and shrimp turns into fertiliser for the plants and this is the critical connect of the SEAS concept. The seafood production also contributes to UAE’s food security. This innovative techno-economic model that helps generate revenue from the aquaculture farm makes the project commercially viable. The facility is managed by the Sustainable Bioenergy Research Consortium (SBRC), a non-profit entity established by Masdar Institute that is part of Khalifa University of Science and Technology, and is expected to scale up to 200 hectares in the move towards full-scale commercial implementation in the next few years. Abu Dhabi’s ambitious Seawater Energy and Agriculture System (SEAS) project to produce alternative aviation biofuel along with seafood will bring overall benefit to economy, environment and food security and provide a boost to the aviation sector. When a Gulf News team visited the pilot facility recently, it looked a small patch of land in a calm and quiet environment. But when officials explained that the experiment could enable the UAE to meet a portion of global demand for biofuels, we realised that the small farm carries a big dream. We were walked around the three components of the facility - the aquaculture ponds, the Salicornia fields and the mangrove wetlands – as a SBRC official explained to us how the fish, Salicornia plants and mangrove support each other. The initial batch of Salicornia plants was planted in 2016 at the SEAS pilot site, and there have been two successful crops until now. The biofuel significantly reduces carbon emissions from the aviation sector, compared to traditional jet fuel. Sustainable Aviation Fuels (SAF) will help the aviation industry meet its goals under the Carbon Offsetting and Reduction Scheme for International Aviation (CORSIA), being implemented by the International Civil Aviation Organisation (ICAO) and The International Air Transport Association (IATA). The sector aims to cap the growth of carbon emissions by 2020 and cut levels to half of what they were in 2005 by 2050. The seafood produced by aquaculture subsystem in the project will also bring benefits to environment and food security, apart from the economy. As the UAE imports a large chunk of its food, an attempt to produce food here will minimise dependence on imports, boosting the food security. The increased commercial production of seafood will reduce pressure on dwindling wild fish stocks. More domestic production means less seafood imports from abroad, which translates into reduced carbon footprints caused by the transportation. Carbon footprint is the amount of carbon dioxide released into the atmosphere as a result of the activities of a particular individual, organization, or community. It begins on a two-hectare facility in Abu Dhabi, that is growing salt-tolerant plant called Salicornia and mangroves, the world’s first desert ecosystem designed to produce fuel and food in saltwater. Salicornia plants and mangroves belong to the Halophytes group of plants; they have a genetic mechanism to tolerate high salinity, hence are suitable to grow in Abu Dhabi, that is irrigated by seawater. Salicornia can be grown as a cash crop to extract oil from its seeds producing biofuel from its seeds. The project facility has three subsystems - aquaculture ponds, halophyte agriculture (fields growing Salicornia plants) and halophyte agroforestry (mangrove wetlands), explained Dr Alejandro Rios, director of Sustainable Bioenergy Consortium (SBRC). 1. 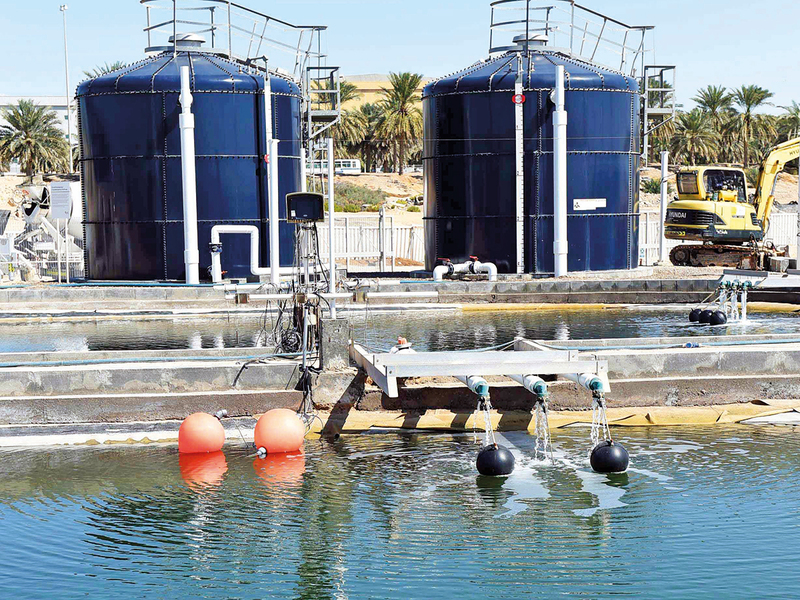 At the facility, aquaculture ponds grow fish and shrimps and the revenue generated from sale of the seafood makes the project commercially viable. Seawater is pumped into the aquaculture ponds and the same water then goes on to irrigates the other two components of the facility - Salicornia fields and mangroves. 2. The waste water from the acquaculture ponds, which contains the fish effluence, is then diverted to fertilise the Halophyte agriculture in fields growing the Salicornia plant. What are Halophyte plants? These are a type of plant that thrive in desert conditions and do not require fresh water or arable land to grow, making their cultivation viable in the UAE. They bear seeds which are harvested and processed to generate an oil that is further refined to make Synthetic Paraffinic Kerosene (SPK), biofuel that is blended with traditional jet fuel to power aircraft. 3. The mangrove wetlands too are irrigated by the same waste seawater from the aquaculture ponds that having fertilised the Salicornia fields which is then diverted to a cultivated mangrove forest. Mangroves perform two vital functions: they absorb the nutrients from the wastewater [original seawater] as well as carbon dioxide from the atmosphere, thus acting as a valuable carbon storage facility. The wastewater passes through the mangroves, and in the process is naturally filtered and treated before being discharged back into the sea. Mangroves absorb carbon dioxide from atmosphere on a big scale helping with carbon offsetting, thus supporting the aviation industry’s initiatives to decarbonise the sector. Moreover, every hectare of mangroves provides an ecosystem protection worth $13,353 per annum, including $8,966 for storm protection, $3,679 for erosion control and $708 for fisheries maintenance, according to experts. RESULT: This entire process achieves the three-way purpose of growing seafood, fertilising the Halophytes and aiding carbon storage thorugh the mangroves while processing the seawater back into its source. 1. The SBRC pilot facility has about half a hectare of land dedicated to Salicornia plants. “You get about two tonnes of seed from the pants per hectare and between 600 and 700 litres of oil [extracted from seeds] per hectare from annual harvest. You can get half of amount of jet fuel after refining,” said Dr Rios. 2. Adnoc Refining (A subsidiary of Adnoc – Abu Dhabi National Oil Company Group) refines the oil at their Research Centre in Abu Dhabi, thus making it a completely home-grown fuel. As the process for refining this vegetable oil is very similar to that of traditional crude oil, the company is using its existing oil-refining infrastructure without any undergoing any major change to its processes. 3. After refining the Salicornia oil, what comes out is the final biofuel product called Synthetic Paraffinic Kerosene (SPK). The SPK is blended directly with traditional jet fuel up to 50 per cent and does not require any modifications to aircraft, engines or airport fuelling delivery systems. 4. UOP-Honeywell, a founding member of the Sustainable Bioenergy Research Consortium (SBRC), offered its Ecofining technology in the refining process of the oil. Abu Dhabi Vegetable Oil Company (ADVOC) has also given essential assistance in the pre-treatment phases. 5. Adnoc Refining’s expertise and infrastructure has helped to meet stringent jet fuel standards. Adnoc Distribution (another Adnoc subsidiary) has also made an essential contribution to the project through the blending and delivery of the biofuel to the aircraft.